When the first edition of Golden Gate Gardening was published, gardeners throughout San Francisco had a resource rooted in the soil of our home; the chapters of this manual tended by a gardener and educator Pamela Pierce. 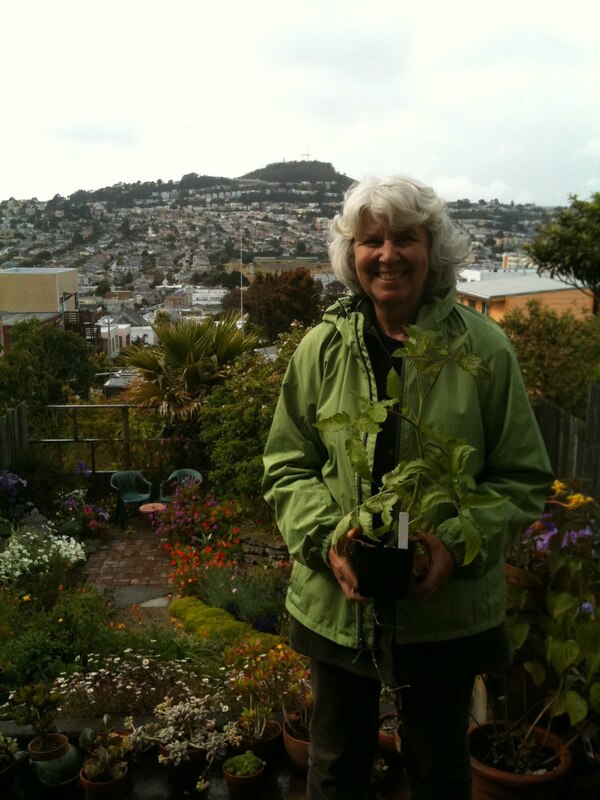 This seminal work continues to inspire, empower and support gardeners all over the city, from small scale planters on balconies to 2.2 acre urban farms in the heart of San Francisco, Pam Pierce is a legend to those of us with green thumb! She contacted Graze the Roof recently in regards to offering the garden tomato plants. Pam Pierce was not just offering any tomato plants, she was offering diverse varieties known for resisting late blight (a disease that can negatively affect the health and harvest of a tomato plant) and for thriving in the unique microclimates of San Francisco. These are plants that Pam started in her laboratory at City College of San Francisco. Thank you Pam! 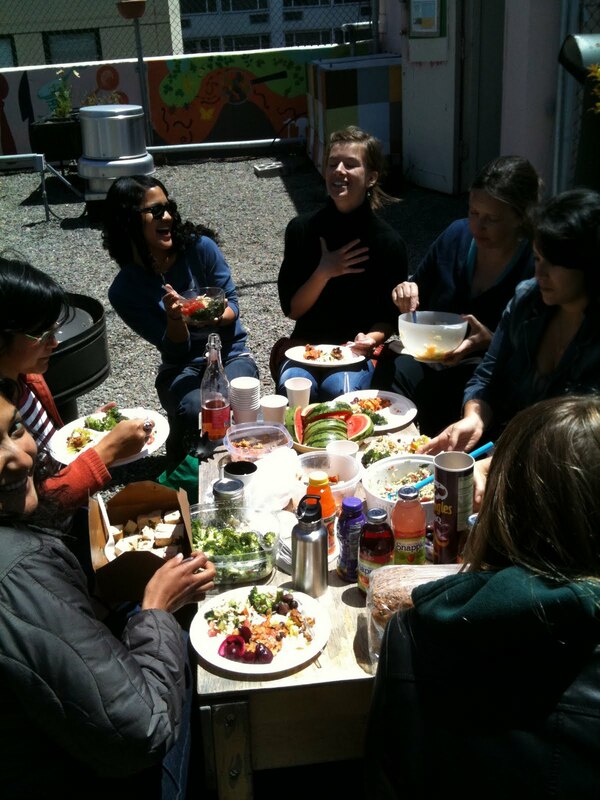 Today was a beautiful day on the roof; sunshine and a cool, refreshing breeze encouraged productivity, camaraderie and creativity. Around noon we were joined by members of the Glide staff who decided to organize a communal picnic lunch and enjoy it on the roof together. Their picnic (as you can see in the photo) was colorful and delicious! Heirloom lettuce is thriving, carrots have sprouted, tomatos stand tall, peas are flowering, kales are developing and the garden has new lessons for us every week. Tis the season to grow, and to garden. Join us EVERY THURSDAY 11a-2pm! Next workshop is scheduled for June 18th: Integrated Pest Management - The natural way to manage garden pest. Contact grazetheroof@gmail.com to register. Throw some fava beans on the grill, they're superb!